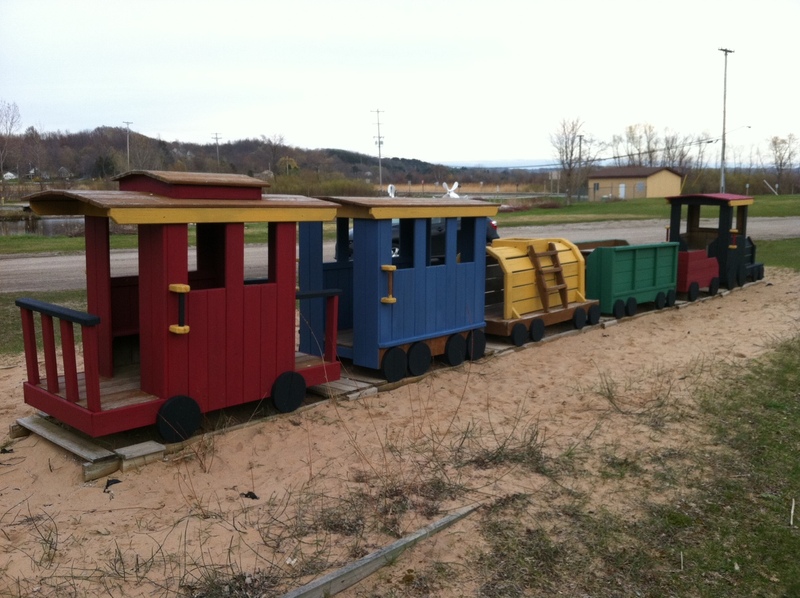 The train, which according to Carolee Ness was purchased by Parks and Rec through its own fund-raising efforts (contrary to what it says on the plaque), shown here at the end of March with its new paint job in progress. During the last week of March, chief color technician and Parks and Rec phenom Jennifer Wilkins, along with elves Merren Garber and Michele Cannaert, undertook to lively up the train in the Mini-Pond/Marina/Farmers Market Park. Jenn and her team spent about 15 hours all told on the project, using stain paid for by Village fan Max McKee. Wilkins also revamped the basketball hoops in Anderson Park with funds from McKee. Kim Zavitz Micham was happy to have the news of the new paint job confirmed: “I was starting to wonder if I was losing it,” Micham said on the Alert Facebook page. “Alright Jenn!!! Your go girl, make our little village look awesome! Thank you!” she added. If you are going to paint the train in lively colors to supposedly create a better atmosphere, then maybe you should also consider clearing up the so called mini-pond. As you are probably well aware that area looks incredibly decrepit, and harshly maintained. Over the years, I have watched the Park, and the train, and I noticed that kids loved the train the way it was, they jumped, ran, and tumbled. And it didn’t matter to them what color it was. It was a nice thing for the kind person who donated the paint to do, but really, should we really be painting the train in lively colors when around it, the place is for he most part, unkept, and decrepit. Or for the Village itself. I am sure the kind person who donated the paint, would be just as glad had the paint gone on something more useful. Look around, and notice the pitiful state the Village lies in. And think to yourselves that maybe a good coat of stain would have protected the train, and lasted longer than a coat of many colors. If you are going to paint the train in lively colors to supposedly create a better atmosphere, then maybe you should also consider clearing up the so called mini-pond. As you are probably well aware that area looks incredibly decrepit, and harshly maintained. Over the years, I have watched the Park, and the train, and I noticed that kids loved the train the way it was, they jumped, ran, and tumbled. And it didn’t matter to them what color it was. It was a nice thing for the kind person who donated the paint to do, but really, should we really be painting the train in lively colors when around it, the place is for he most part, unkept, and decrepit. Or for the Village itself. I am sure the kind person who donated the paint, would be just as glad had the paint gone on something more useful. Look around, and notice the pitiful state the Village lies in. And think to yourselves that maybe a good coat of stain would have protected the train, and lasted longer than a coat of paint. Stain was used, not paint. According to the Park and Rec Commission, this is just one step in a lot of great plans for the Village, including a proposed boardwalk to replace the disjointed mini-pond docks. All this works takes time and volunteer enthusiasm, and in some cases, fundraising or donations, to get going, but things are definitely happening. Parks and Rec will keep everyone up to date on their plans through the Alert. Anyone is welcome to attend Park and Rec meetings and volunteer for community projects or just share their ideas.